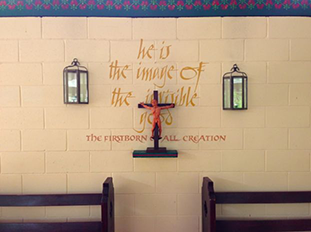 The Old Friary has been owned and run by the Anglican Church in Brisbane since 1932. The Old Friary is not a parish, but a special centre of the Anglican Church. It is currently under the Ministry Education Commission (MEC) based at St Francis Theological College in Milton. The formal name of the Old Friary is the Centre for Christian Spirituality,. The new Administrator, Angie Wilson, will be the central person and contact point at the Old Friary. The key manager of the Old Friary is MEC's Property, Finance and Administration Officer, Stephen Clarke (see "People"). The Old Friary really was a Friary - between 1965 to 1987 it was home to the Anglican Franciscan Brothers who also ran a pottery and nursery from the site which were well patronised by local people, and, among other activities, provided a nucleus for young people to gather as a focus for christian action and worship. They carried out significant social work in the Brisbane area. Their impact on the Kenmore region was such that local people came to refer to the site as "The Friary". But the story of the Old Friary began well before their tenancy. After the Franciscans left, it was disused for a few years until a group of hardworking "Friends of Brookfield" led by Jack Thurgood from St David's Anglican Parish, Chelmer, brought it back to health and beauty. At the same time, Fr David Binns was looking for a venue to use for contemplative spirituality. This resulted in a unique and badly needed ministry, providing retreats, workshops, innovative liturgy and a place to nurture spirituality including spiritual direction, theology, meditation, music, drama and the arts, under the brilliance, wisdom, artistry, guidance and hard work of Fr Binns. In this incarnation, the Old Friary was renamed the "Brookfield Centre for Christian Spirituality". After his retirement at the end of 2003, the "Brookfield Centre" diversified to accommodate a range of community groups and activities. Franciscan Friars or Brothers traditionally live in community, working, eating and praying together. The brown habit, sandal-clad Brothers, who take life-long vows of poverty, chastity, obedience and worship, worked within the community through Meals on Wheels, a self help project for young unemployed, as well as providing assistance with the Ecumenical Coffee Brigade which served food and refreshments to street people and park dwellers. As the community of Brothers grew, they also pioneered residential care for social dropouts – men with psychiatric disorders, youngsters on probation, those who had served prison sentences – needing rehabilitation as well as offering the venue as a retreat to others seeking peace and serenity. Although the Old Friary was not originally (and is no longer) a monastic house, something of the spirit of those communities remains as a place of worship and work, of community and contemplation. Part retreat house, part community centre, part place of worship and of prayer, the Old Friary's role is changing and the next decade will no doubt see dramatic alteration in its role and functions. For the present, it is an active and much loved place for many groups in the local community. The role of the Old Friary has changed throughout the years. As we look to the future, it is likely to evolve as demographic and financial pressures dictate. We, the Friary Community, are trying to support initiatives that maintain the site's important spiritual value and physical integrity so that future generations will have the opportunity to appreciate it and draw value and strength from its peacefulness, community placement and local history. Find out more. For those who are interested in the management and technical records of the Old Friary, a series of resources will be made available in time. For the present, please contact Ian Ross (rosses.home@gmail.com) for more information.